Five men, including one policeman and two employees of Republic Bank, were Friday arraigned in connection with the failed bank robbery more than one week ago. A former bank employee- Jamal Haynes- was jailed for six years after he pleaded guilty to attempting to rob the bank and several other charges. The policemen charged are Constable Anfermee Blackman and Rural Constable, Gladstone George. The now former bank employees are Jamal Haynes and Shawn Grimmond. The charge include that they attempted to commit a felony which is attempt to rob Republic Bank Limited. Several men staged a brazen attack on Republic Bank’s Water Street branch on July 4, 2017 in the hope of carting off several night deposits from the night before. However, one of them, Elton Wray, was shot dead and Haynes was shot to his legs. Investigators said he was wearing a dreadlock wig at the time of the incident. Except for Haynes, the others were remanded to prison until August 11, 2017. 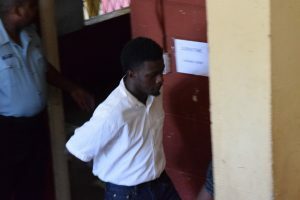 Haynes,24, of 4 Norton street Wortmanville, Georgetown pleaded guilty to four of the six charges that were laid against him. 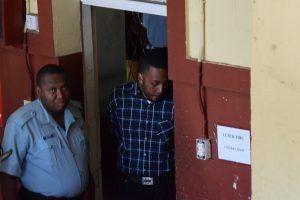 It was alleged that on July 3 at Sparendaam, East Coast Demerara being in the company others and armed with guns he robbed Ryan Myers of a motorcar, cell phone and cash all totaling GYD$2.9 million dollars. 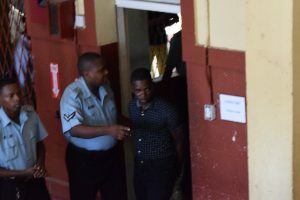 The other charge alleged that July 4 at Water Street, he discharged a loaded firearm to Leon Joseph, a police officer with intent to maim, disable or disfigure him. Haynes denied having knowledge of these two charges. The four charges to which Haynes pleaded guilty states that t on July 4 at Water Street, he had one 9MM live round along with a 9MM pistol. Haynes who is an ex-employee of Republic Bank was also charged with unlawfully obstructing the course of justice by holding Thendukar Singh as hostage. Haynes told the court that he and his now deceased friend, Elton Wray, were planning to rob someone at the bank he had no knowledge that they were gonna rob the Automatic Teller Machine (ATM) of the overnight money. It was until Wray shot at the glass door, he said, he knew what was happening, hence he went inside and held Singh as hostage while police and Professional Guard Service (PGS) guards were shooting at him. 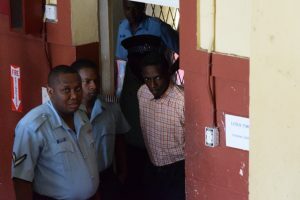 Another charge in which Haynes pleading guilty to was that of attempting to commit a felony which is to say, being armed with firearms he attempted to rob, Republic Bank Limited. The Chief Magistrate remanded Jamal Haynes for discharging a loaded firearm and committing robbery under arms to August 10 and 11. She sentenced him to six years behind bars for having firearm and ammunition in his possession, obstructing the course of justice and attempting to rob the bank. 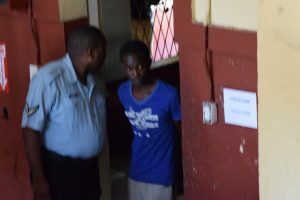 Meanwhile, 24-year old Rural Constable George, 21- year old Police Constable Anfernee Blackman, 23-year old old bank employee Shawn Grimmond and 24-year old construction worker Keron Saunders -pleaded not guilty to attempting to rob Republic Bank on July 4. Grimmond was represented by Attorney-at-Law, Dexter Todd who told the court his client was at the time at the upper flat of the building when the robbery occurred and he had no knowledge until he went downstairs.